I love shopping baskets. They’re the small, around town, quick-as-a-whip cars that are easy to park and easy to drive. I learned to drive in one in the 1970s and today I still look at this auto-market segment as the most challenging and, in so many ways, the most rewarding of all modern car designs. Almost any manufacturer can build a big car with a big budget and sophisticated features and design elements to titillate the senses. But can modern car builders bring all of the modern driving tricks and tools into a small compact car, making it a delight to drive and all on budget? Suzuki has achieved all of this with the Ignis. There’s enough retro styling to suggest it’s a time machine with some modern tricks to keep it in touch with the modern era. 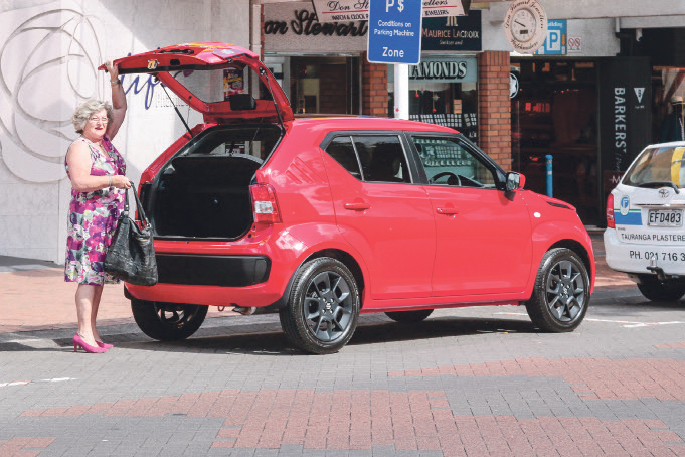 So it’s back to the future with the retro Suzuki Ignis – a modern shopping basket nod to the past. There was only one question to answer. What happens when this baby hits 88mph? There is something special about the retro Ignis. It’s not just a compact car - it’s marketed as an SUV. Suzuki is known as a small car specialist, so if any major auto manufacturer can pull off a compact SUV, it’s Suzuki. The hint of this being a true crossover from small compact to SUV is the ride height. As a Suzuki Swift owner and daily driver, it was clear to this reviewer that the Ignis is not just a variation on the Swift, but a new ride with a small but noticeable uplift to SUV height for the driver to enjoy a better road view. The interior of the four-door Ignis is also a bit special, with a large speedo dial front and centre in the dash and the unusual ‘pipe-like’ interior door handles adding to the quirky, fun nature of this retro ride. There is also ample leg room and luggage space that acts like an optical auto illusion. How can a car that seems so small have so much space, leg room, screen visibility and ride height? 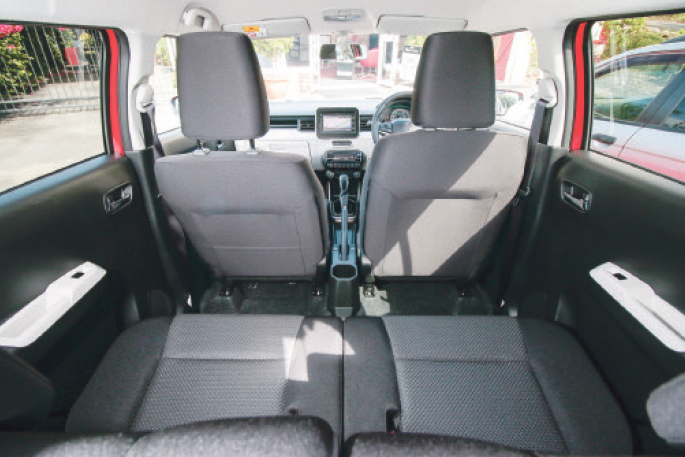 The rear seats can slide forward or backward to increase rear passenger leg room or luggage space. It’s a great trick, optimising available space depending on the need of the day’s drive. On first glance the Ignis looks all angles and boxy lines, but there is something special going on with its instant retro styling. It’s hard to put your finger on just what it is that appeals, but it all started with the near vertical louvre indents on the rear pillar. No matter how I tried I couldn’t take my eyes of a small but very telling attempt at retro styling. It works, and it says much about the appeal of the Ignis. This car just makes you smile inside and out! Hitting the road around Tauranga confirmed the obvious: this is a fun drive because it’s nimble, quick, easy to turn and park and, given its quirky-funky on-road retro looks, it caused a few heads to turn for a second look-see when parking on Devonport Road. One of the great things for smaller cars is they‘re lighter, and with less weight to push are easier on fuel. 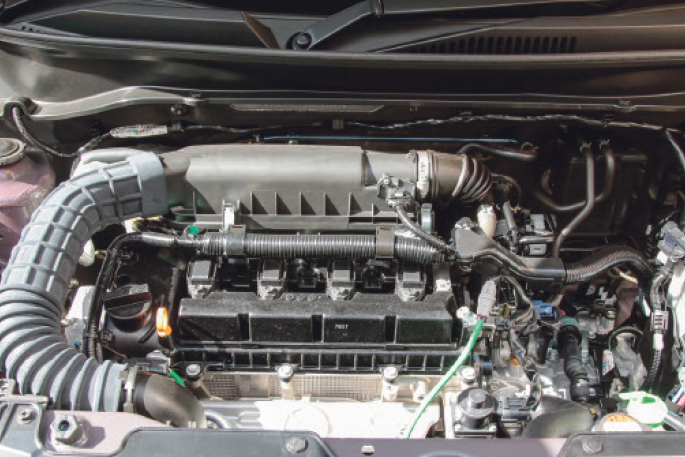 Suzuki claims fuel consumption of 4.7-4.9L per 100km for the Ignis, and it’s likely at a mere 865kg in weight that the naturally-aspirated 1.2L 4-cylinder engine will do exactly that. On the road and in hand the Ignis is light, and an easy CV transmission underfoot makes for a snappy, breezy driving experience. The centre-mounted SAT-NAV screen keeps drivers in touch with where they are, while Suzuki’s Electronic Stability Programme keeps them safe with extra shock absorption built into the bonnet front wiper area, front bumper and bonnet lip to reduce collision impact. This small-sized compact SUV is simply a delight. Sometimes cars grow on the driver as they go about their on-road business. There is something in the mechanical DNA that provides strong appeal as it moves around town. For this Suzuki Swift owner (and fan) the Ignis is a slightly different drive. 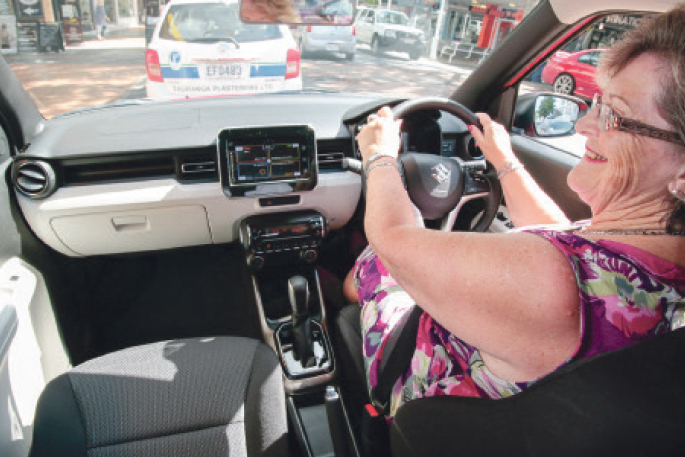 It is an SUV after all, and while it won’t be towing boats or caravans with ease, or taking on real tough off-road duties, it does provide an SUV driver experience in terms of driver height and an in-built sense of extra safety. The Suzuki Ignis may be a time traveller, but it’s one that belongs in the present day. The CVT transmission, centre-mounted LCD screen, satellite navigation, multi-media replay including Apple Car Play and AndroidAuto, cruise and climate control, steering wheel-located phone control, six air bags, reversing camera and push button start are all hallmarks of modern car design that have no equivalent in the past. This isn’t 1955. It’s 2018 and Suzuki has come a long way from the past to deliver a modern take on the shopping basket with a personality-filled ride that will be at home around town and on highway trips. The Suzuki Ignis does a little bit of everything extremely well and, combined with customised trim and exterior highlights, it is a ride unique to each owner. Add in that Suzuki has been deemed the most reliable car in New Zealand according to Consumer New Zealand and the Ignis represents a great mix of design, personality and reliability. This Suzuki Swift owner/driver is thinking the Ignis is right on time as the next shopping basket to live in my garage. It’s a fun, funky drive and the Ignis’ quirky looks have it oozing character no matter what time period you’re driving in.